OMEGA's platinum RTD probes are now available in 1.5 mm diameter for faster response times. Note: Because of their smaller physical size, these probes are more fragile and should be handled with greater care than our larger diameter versions of the same probes. Avoid subjecting probes to bending, flexing or vibration. * Sheath Lengths: 150, 225, 300, 450, or 600 mm. Specify 150, 225, 300, 450, or 600. Notes: Model Numbers shown with Lead Style 2 (3-wire configuration). Probes are also available in 2-wire (Lead Style 1) and 4-wire (Type 3) configurations; Contact Sales. Minimum length for any style probe is 100 mm. For intermediate lengths, use next longer probe price. Over 600 mm, contact Sales. To order longer lead lengths on the PR-11 style probes, contact Sales. 1.5 mm diameter probes cannot be bent. PR-11-2-M15-300, Transition-style probe, three-wire configuration, 100 ohm, 1.5 mm diameter, Temp. range from -30 to +350°C, Class A Tolerance. PR-13-2-M15-225: Pt100 Series Quick Disconnect probe, three-wire configuration, 100 ohm, 1.5 mm diameter, Temp. range from -30 to +350°C, Class A Tolerance. PR-16-2-M15-300: Pt100 probe with handle and coiled cable, three-wire configuration, 100 ohm, 1.5 mm diameter, Temp range from -30 to +350°C, Class A Tolerance. PR-17-2-M15-600: Pt100 probe with miniature quick disconnect probe, three-wire configuration, 100 ohm, 1.5 mm diameter, Temp. range from -30 to +350°C, Class A Tolerance. Please use the "Part Number Builder" below to get pricing and availability on all Styles! 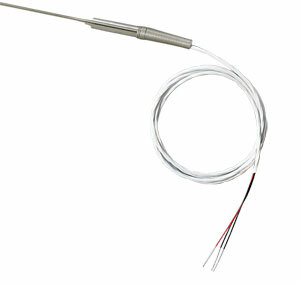 Quick Disconnect Probe, w/PFA Leads, 1.5 mm Sheath Diameter, 300 mm Sheath Length, Miniature Connector.